I have been practicing yoga for around three years, but I have to confess that I was not always a fan. My friend had been trying to get me to go with her for several years, but honestly, I thought it was basically stretching, with some chanting and meditation thrown in. Boy, was I wrong!! Now, I try to fit in yoga three times a week and I feel like my body is in the best shape ever at almost 40! I practice Power Yoga, Hot Yoga, and Body Flow (a mix of yoga, tai chi, and Pilates) and all of these are actually a great workout. I will be sharing with you my essentials, although you do not have to have all of these things to do yoga. 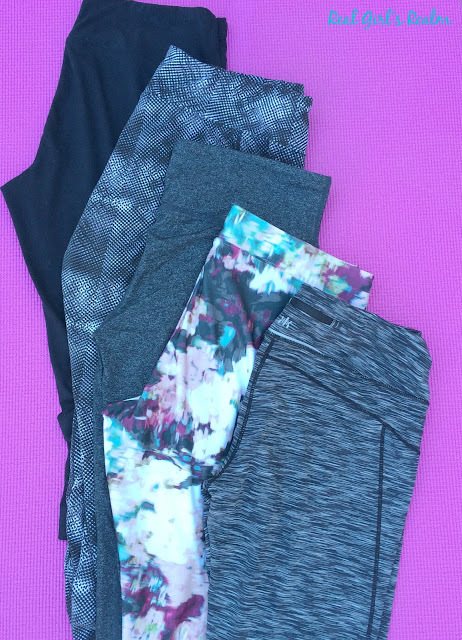 I will also be sharing some of my favorite yoga wear, since working out is more fun when you look cute! Cute and comfortable workout wear does not have to break the bank. I think it is insane to spend hundreds of dollars on yoga wear (y'all know the brand I am talking about)! I will be showing you affordable options that you can find at Target or TJMaxx; that are all under $20. 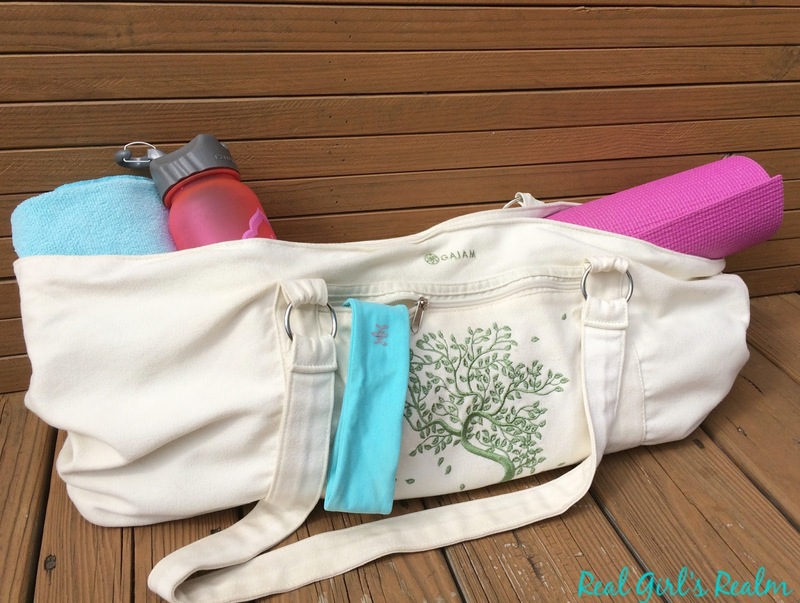 Yoga Bag - I keep all my essentials in a bag by Gaiam. It is a canvas bag that is washable and has zippered pockets on the outside and inside to hold my wallet, phone, and headbands. It is roomy enough to hold a mat, two towels, and a water bottle. Yoga Mat - I have a basic pink yoga mat by Gaiam, which you can find at any Target, Walmart, or TJMaxx. 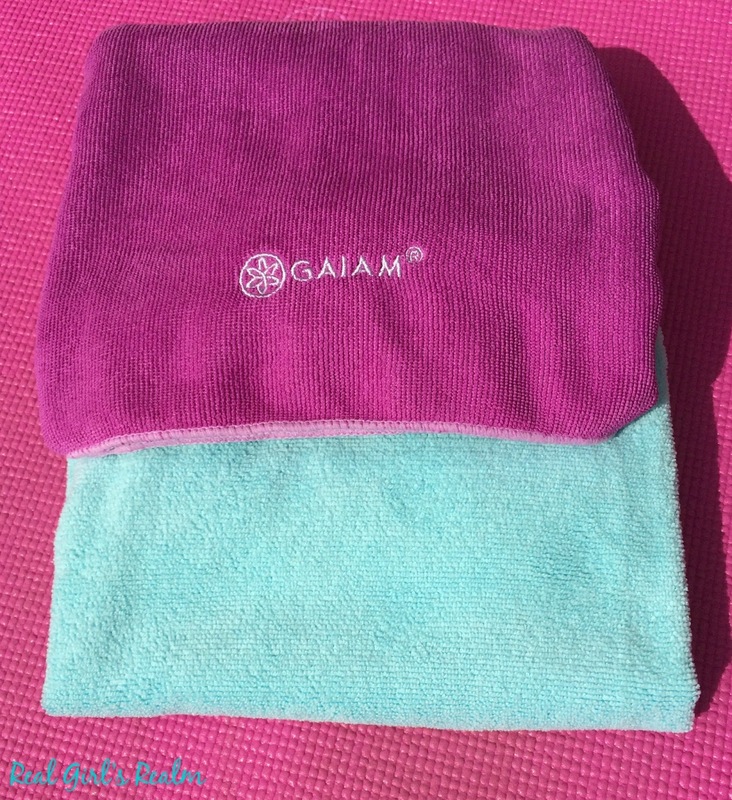 Yoga Towel - For hot yoga, I use microfiber yoga towels by Gaiam. I have a large towel to cover my mat and a smaller hand towel to wipe my sweat, cause it gets hot in there! 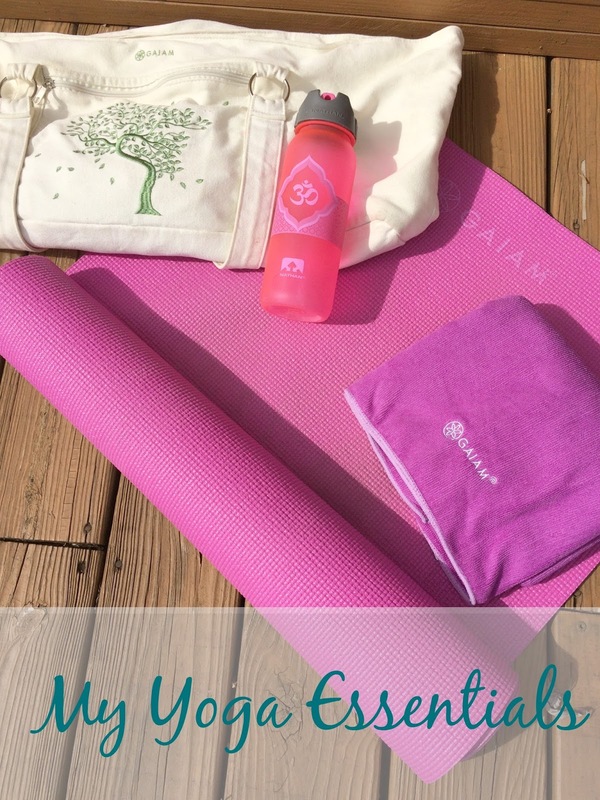 Water bottle - This is a must, especially for hot yoga. I picked up my Nathan brand bottle from TJMaxx. Foam Blocks and Straps - These accessories can help you get deeper into a pose. I sometimes need to use a block when doing reverse twist poses, because I am not flexible enough the reach the mat. I want to be comfortable, yet cute when I am working out. I usually wear a sports bra with a tank top and yoga pants. I usually stick to black or dark pants because they are more slimming and hide sweat. 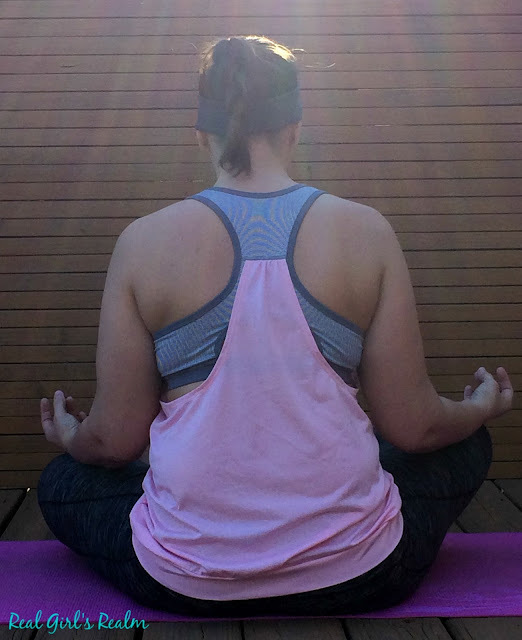 When doing hot yoga, I like to wear my hair up and use a headband to keep my bangs out of my face. One of my favorite brands for sports bras is C9 Champion from Target. I like the criss-cross straps on the C9 bras because they give more support and the dry wicking fabric keeps me cool when I sweat. C9 Champion offers a variety of colors and styles for any body type. For yoga pants, I prefer the style that does not have the roll down top. I have bought most of mine at TJMaxx (aff link) and Marshalls and have never paid more than $20 for them. Do you practice yoga? If so, are any of these your must haves? 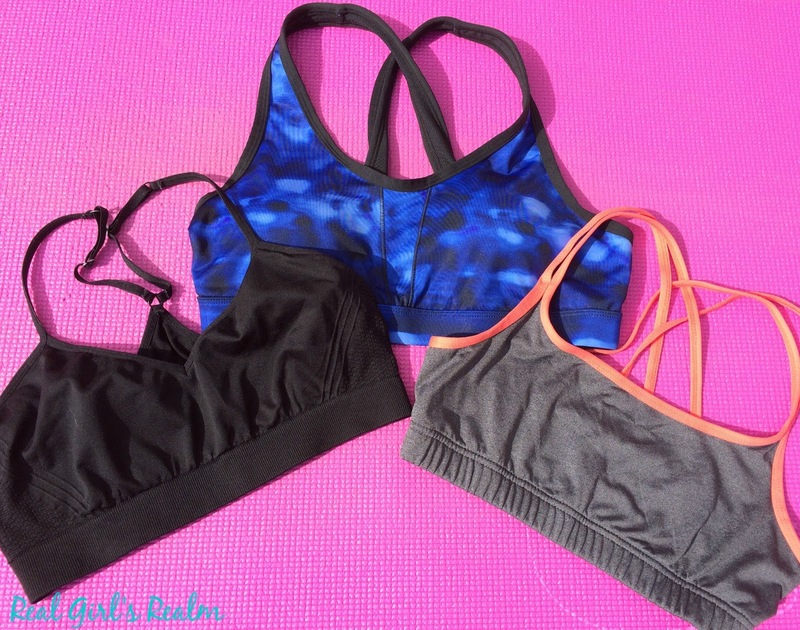 Disclosure: I received the C9 sports bra at a discount from Influenster in exchange for an honest review. I am almost 40, too! I have been thinking about trying Yoga again recently, especially maybe an essentials oils Yoga! Those work out pants are so cute! Ohh, the essential oils yoga sounds interesting! Thanks for visiting, Carrie! oooh. I miss the days of hot yoga. A couple years ago I was an avid attender - and all these items are total essentials! I love your yoga pants, by the way, very cute! Thanks, Ashley! Hot yoga is so refreshing! I am sure you will be able to get back in it soon! I did yoga for several years and then got away from it when we moved last spring. I recently started going again and am so happy to be back at it! I always feel amazing when I leave! Thanks for sharing your essentials! Jill, I definitely can tell when I miss a class or two! It really makes a difference in the way I feel mentally and physically. Great collection of items! Thanks for sharing these! I don't do Yoga, but if I did - I would totally buy that bag. Love it! Thanks for sharing with us at Friday Favourites, Mary. So glad you can join us. Thanks for having me at Friday Favourites! The bag really is great for carrying everything you need! I love these pants! The quality of workout clothes is fantastic. I got a small and they fit perfectly, just as I expected. They aren't thin to where you can see through them, and not too thick where they make you too warm when working out.